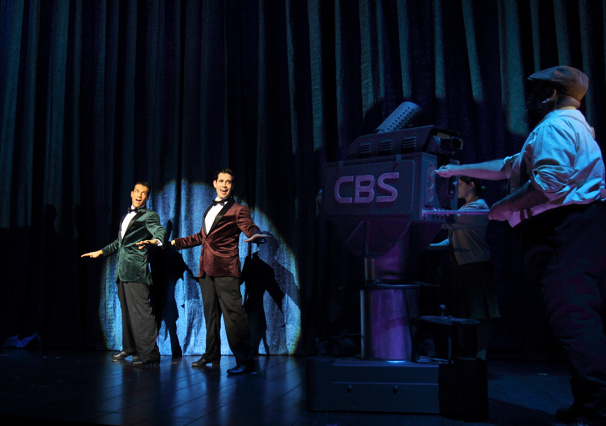 Danny Mac & Dan Burton in "Irving Berlin's White Christmas"
Let yourself go! Irving Berlin's White Christmas, the celebrated stage adaptation of the iconic film, has scheduled a West End return to London's Dominion Theatre this winter. Previews will begin on November 15 ahead of an opening night set for November 25. The feel-good family musical will star Danny Mac (Sunset Boulevard) as Bob Wallace and Dan Burton (Gypsy) as Phil Davis, reprising their acclaimed turns from a successful run at Curve, Leicester. Further casting will be announced soon. Featuring a book by David Ives and Paul Blake, White Christmas features a score of classic songs from the catalogue of Irving Berlin, including "Blue Skies," "Sisters" and the beloved title song. The production will be directed by Nikolai Foster and choreographed by Stephen Mear, with musical supervision by Stephen Brooker, orchestrations by Larry Blank and new musical arrangements by Jason Carr. The design team will include set designer Michael Taylor, costume designer Diego Pitarch, lighting designer Mark Henderson and sound designer Tom Marshall. Irving Berlin's White Christmas will play a limited West End engagement through January 4, 2020.